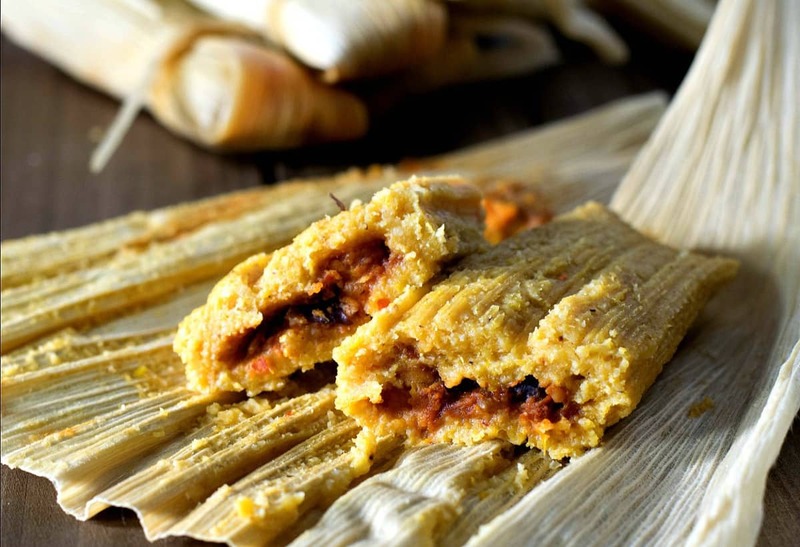 One of my fondest memories of living in New Mexico during the holiday season was fresh, homemade Tamales, so moist and tender they practically melted in your mouth. So this year I decided to try and make them myself, and let me just say … these Oil Free Vegan Tamales will definitely be a new holiday tradition for my family. A bit of effort? Yes, but SO mouth-wateringly delicious! Let me be honest and say before this recipe I have never made Tamales before in my life. If you’re in the same boat, but want to try and make your own Tamales … I highly, can’t say this enough, HIGHLY recommend you spend a little time on YouTube to learn the ins and out of Tamale making. It’s not that it’s hard, it’s not. I mean if a rookie like me can do it, so can you. It’s just that being familiar with the steps will help in the long run. But these will take some time – so prepare yourselves and if possible – enlist the help of a family member or two! There’s no better way of creating a new holiday tradition – than setting up a Tamale Assembly Line! For the Sauce in this recipe, I fell back on my own personal favorite – my New Mexico Red Chile Sauce. I use it in the filling, in the Masa, and as a topping sauce. 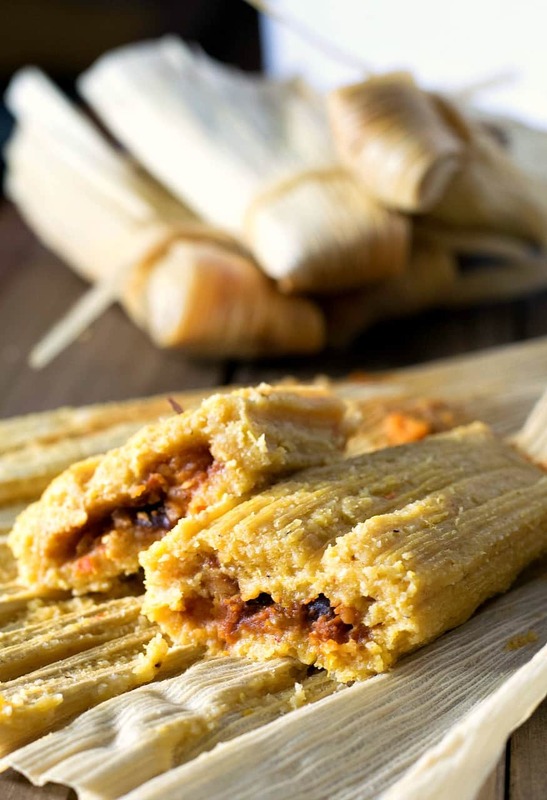 It’s easy to make from dried chile pods and really adds to the authentic flavor of the Tamales. You’ll also need some Tamale Corn Flour (Masa) and some dried Corn Husks (Hojas para Tamales). If you can’t find the Chile Pods, Masa, or Husks in the Mexican section of your Grocery Store – I ‘ve added them to my Amazon Store so you can always buy them online. I say these are Oil Free Tamales, because traditionally the Masa is made with lard. It’s what makes them so light and fluffy. Obviously, I don’t eat lard anymore so I needed something to replace the fat – so I used the one vegetable that I knew had a high-fat content but was also healthy and not highly processed. And before I get the onslaught of GMO texts…… there ARE brands of canned corn that are Non-GMO. Right? Corn? For corn tamales? I mean what could be more fitting? Ok, so enough with all of that. I know you’re just itching to make these, so let’s get right down to it. Woohoo! Let’s make some Tamales! First off, we’re going to need some Red Chile Sauce…. so here is a link to my Easy New Mexican Red Chile Sauce. I use it for both the filing AND the Masa, and it’s really good drizzled on top too when they’re all done. Make the Chile and set it aside. This recipe makes about 2 dozen tamales, so take about that many Corn Husks and immerse them in a big bowl/pot of cold water. Weight them down so they stay submerged. Let these soak for at least 1 hour, but longer is better. You might want to add a few more to use for strings as well, or in case you find a small or torn husk while you’re making the tamales. Better safe than sorry. Peel a large Sweet Potato and cut it into small bite-sized cubes. We’re going to boil this until tender, about 10-15 minutes. Meanwhile, dice ½ of a small onion and start it sauteeing in a pan with a tablespoon or two of Low Sodium Veg Broth. Also, drain and rinse a 7oz can of Whole Green Chiles and cut them into long strips. Add these to the pan with the onion and simmer until softened. Drain and rinse a 15oz can of Black Beans and add them to the pan with the veggies. Add another tablespoon or two of Veg Broth if needed and mix well. Season with a little Cumin and a pinch of Salt. Once the Sweet Potato is done, drain and add the potatoes to the bean/onion mixture. Add 2-3 ladles of the Red Chile Sauce (about ½ to ¾ of a cup) and mix. Take a potato masher and lightly mash the potato and some of the beans. You don’t want it too chunky because it’s going inside your Tamales. Drain a 15oz can of Whole Corn Kernels and add them to your blender. Puree on high until well blended and smooth. You may need to add 1-2 tablespoons of water to get the blending process started. You should end up with about 1 cup of Corn Puree. Add the Puree to a mixing bowl and with a beater, whip it for 1-2 minutes. I used my Kitchen Aid Stand Mixer with the paddle attachment. Slowly add 1 ½ tsp Baking Powder, 1 tsp Salt, 1 tsp Mexican Oregano, and ½ Garlic Powder. Finally, add 2-3 tablespoons of the Red Chile Sauce too. Let that mix until it’s well blended. Slowly add 1 cup of Masa Tamal Corn Flour. It will get thick and dough-like so thin it down with 1 cup of Veg Broth. When that’s well mixed, add another cup of Flour, followed by another cup of broth and continue mixing. Repeat this one more time with another cup of flour and broth. Now here’s where you just need to really watch the batter ….it should be the consistency of peanut-butter or a thick pancake batter. So use the remaining ½ cup of flour if needed to get that consistency. Finally, it’s time to assemble our Tamales. 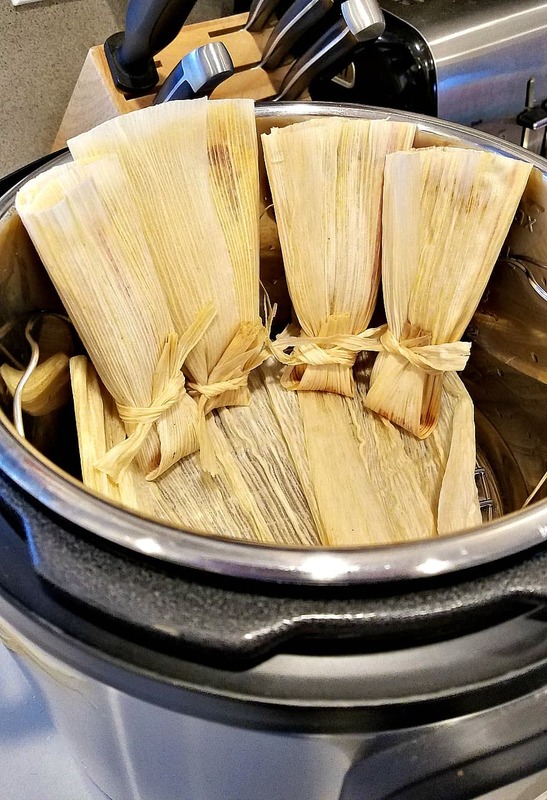 I used my Instant Pot to steam my Tamales but if you don’t have an Instant Pot – any large pot with a steamer basket will do. For the IP Folks – use the trivet that came with your pot and add enough water to the bottom to just come up to the bottom of the wire rack. Cover the trivet with extra Corn Husks to prevent the Tamales from falling through. Lay down a kitchen towel to lay the corn husks on – as things are about to become just a little bit wet and messy. Take a Corn Husk that has been soaking and lay it down on the counter with the tapered end pointing toward you and pat dry. (the smooth side should be up). Take a rubber spatula and spread about 2-3 Tbs of Masa in the center of the husk. Leave the edges clear as well as the bottom 2″ or so. I tried to make a nice 3-4″ square about ¼ thick. To the masa, add 1-2 tsp of filling right down the center. Now gently take one side of the husk and roll towards the other. Kind of tuck the husk under the masa on the other side and fold around to seal. Take the bottom pointy-end and also fold it up so only the top end is open. I used some of the smaller husks as ties, and simply ripped them into long strips. Tie one around the bottom to hold your folded end closed. I realize how hard this is to imagine or picture in your mind by just reading…. so if you’ve never made Tamales before I HIGHLY recommend you watch a few YouTube videos to learn how the rolling and folding part is done. Now take your finished tamale and place it vertically in your IP/Steamer. Continue until you have no more room in your steamer basket or you run out of Masa. For all you IP Folks, attach the lid, make sure it’s on SEALING, and press STEAM for 45 minutes. I realize this may seem like a lot of work (it is), but it is SO worth it, especially if you can involve your friends or family. I remember visiting a good friend in New Mexico one Christmas. And all of us were gathered in the kitchen making these wonderful Tamales together…. And as this year comes to an end, I want to thank all of you for the many precious memories we’ve shared together this year. And here’s to an even better, healthier 2018! This year, I decided to make some homemade Tamales, and let me just say ... these Oil Free Vegan Tamales will definitely melt in your mouth and become a new holiday tradition! Prepare Red Chile Sauce from the following recipe and set aside. Soak 25-30 Corn Husks in a bowl or pot of cold water for at least 1 hour. Make sure to add a plate or something to the top to keep them immersed. Peel and cube Sweet Potato and boil until fork tender. About 10-15 minutes. Meanwhile, dice the onion and add to saute pan. Also, cut Green Chiles into strips and add to saute pan. Simmer until softened. Drain and rinse the Black Beans and add to onion mixture. Season with Cumin and a pinch of Salt. When Potato is tender, drain and add to Beans. Also, add 1/2 to 3/4 cup of Red Chile Sauce and mix well. Lightly mash with a potato masher and set aside. Drain the can of corn and add to a blender. Puree on high until smooth. You may need to add 1-2 Tbs of water to get it started. Add the corn to a mixing bowl and whip for 1-2 minutes. Slowly add Baking Powder, Salt, Oregano, Garlic Powder, and 2-3 Tbs of Red Chile. Mix well. Slowly add 1 cup of Masa and mix. Add 1 cup of Broth to thin. Add another cup of Masa and allow to mix, and then thin with another cup of broth. Repeat one more time. Masa should have the consistency of Peanut Butter or a thick Pancake Batter. Use remaining 1/2 cup Masa Flour to achieve that consistency. Prepare your Steamer or Instant Pot by filling the bottom with water just up to the wire rack of the trivet. Cover with Corn Husks if necessary to prevent Tamales from falling through. Take 3-4 smaller Corn Husks and rip them into long strings to be used as ties. Take a large Corn Husk and lay it down in front of you, smooth side up, and the pointy, tapered end towards you and pat dry. Spread 2-3 Tbs of Masa in the center of the Husk leaving the edges clear as well as the bottom 2-3". I made a 3" or 4" square, approximately 1/4" thick. Lay 1-2 tsp of filling down the middle of the Masa and gently roll the sides until the Masa is sealed. Wap the husk around and fold the bottom up to seal. Secure with a Corn Husk Tie. Leave the top open. Place assembled Tamale in Steamer Pot vertically and repeat until the pot is filled. Attach Lid and steam for 45 minutes or until Masa is cooked through. IP Users make sure your lid is set to SEALING and use the STEAM Feature on your IP. You can cut off the empty Corn Husk tops if your Tamales poke up past the rim. This looks FANTASTIC, thank you for enabling me! I knew I wanted to learn to make tamales! My favorite flavor of tamales are the pork with the red sauce. Do you think it is possible to modify the filling to use the jack fruit like when making BBQ sandwiches? By all means. My first attempt I used Soy Curls in Red Chile. They were really good too! Can you make the tamales 1 day Head and steam them the next day? Also 1 – 2 tsp of filling? Shouldn’t that be more? Thanks! It should be fine to make them a day early so long as they are well-covered and, depending on the filling, refrigerated. Congratulations your writing style, it is coming along nicely. Again, Good Job! HI Chuck! I’m wondering what I did wrong…I tried making the New Mexican Red Chile Sauce and it came out very bitter. That being said, I used the water I boiled the Chiles in for the 2 cups of water the recipe called for..More or less to thin the sauce. Should I have used plain water? I’ve had someone else say this too a while back. I don’t notice it, but I am used to NM Red Chile so to me, it’s not bitter at all. But, try putting the chile in a pan and gently simmering it for 20-30 minutes. I found that 20 mins in the oven was too long for my chilies, and that really impacted the flavor. When I left them for just 10, the flavor was just what I expected. It was a little sour, but a very little bit of sweetener completely resolved that. I followed ur instructions pretty closely with the measurements for flour & corn and the seasonings . I used a different chile sauce using guajillo chile, tomatoes, & garlic. Not sure why my masa did not seem to look thoroughly cooked. I steamed it in my crockpot for 2hrs at least and it should be cooked but thr masa just didn’t seem to solidify. Don’t know what I did wrong :(. Made it and loved it! I am so proud. Thank you, thank you! This is my second full vegan meal that the whole family loved (after 6 weeks of trying). I’m so excited! There is hope. And it was so very delicious. Well done. These are delicious. I roasted the corn and sweet potatoes. New Mexico Chile sauce is great. Also used tamales dough recipe with pok and chicken. My son also used jack fruit. Your instructions are very easy to follow. Perfect! I didn’t need to steam the tamales for 45 minutes. Just 30 was plenty. I didn’t use the chili sauce, and instead I just used tomato paste, because my roommates can’t handle the spicy. Thank you for these wonderful vegan recipes! 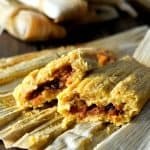 I’m going to try your tamale recipe and red sauce recipe today and I wondered if you used quick release or natural release with the tamales in the Instant Pot. Thanks again! Sounds awesome, have to try it, though I want to use chaya leaves as an edible wrap to boost nutrition, add flavor and because I’m cheap and lazy… it’s a free perennial vegetable I grow in the yard here in Florida where traditional greens refuse to grow during our summers.. It’s a south American shrub with large leaves also called “tree spinach”, and it;s actually what led me here for a good vegan recipe because i read it’s used to wrap tamales and the like where it is native. .It may be a green, but it’s nothing like spinach really, the leaves are dense and firm, almost “meaty” and the flavor mild and versatile. Like a lot of tropical vegetables though. it has to be cooked properly to neutralize the cyanide the plant produces to protect it from insects, I don’t use chemicals so a pest free plant here works for me! Just five minutes of steaming in the IP and I get a tasty,flexible, free stack of nutritious edible wraps I used them last time to make dolmades and they worked great. I ramble, sorry! And thanks! Is it possible to make this “casserole” style? Skip the husks? Say for when you’re in a time crunch. That would be interesting to try – thanks. these look yummy. how would i be able to find out the nutrition information in them? Fats, saturated fats, sodium? Sorry I do not include those. I can tell you ALL of my recipes are very low-fat and have NO saturated fats or cholesterol as I do not use animal products or coconut. 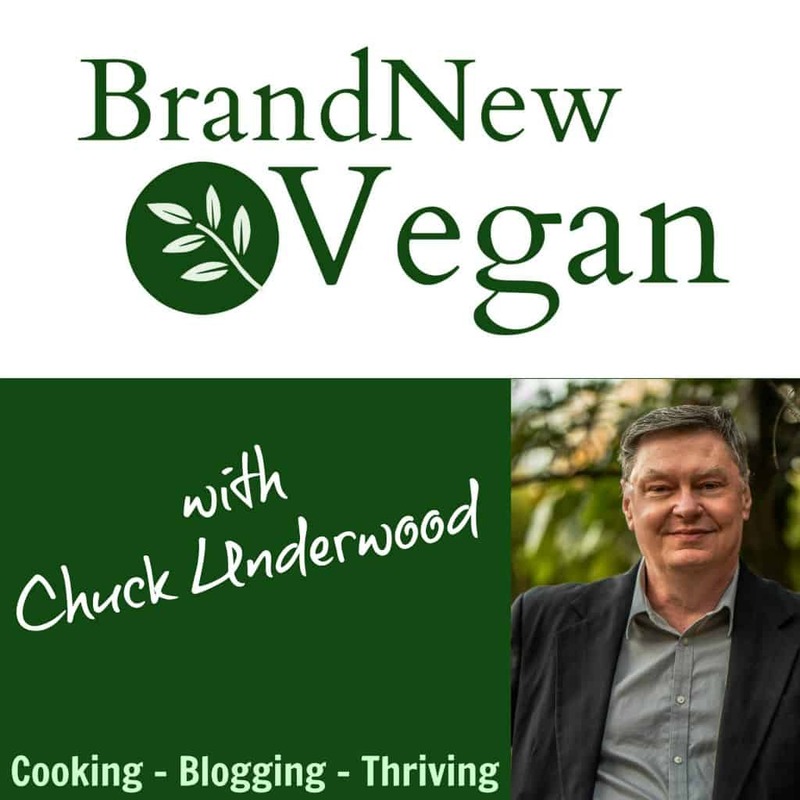 The process to include this information is so subjective to which program I use, what you consider a serving to be, which brand of ingredients you use, so many things……. They are not 100% accurate so I don’t bother with them. My mass turned out “doughy” not flakey like store bought, any idea what I could do to correct this? The flavor was good just the texture of the mass was off. Thanks for any suggestions. As stated from another reader, mine may have been too wet? Steaming in a regular basket it took way longer than the 45 minutes and the masa never really cooked through. It remained sticky, but I followed the recipe to the T.
I had the same issue as a couple of people above. I steamed them for over 2 hours, but they were still wet and stuck to the husks. What did i do wrong? Did anyone solve this issue?? I got the question out to the group Brian. I know mine and a ton of others have turned out great (based on emails and comments), but a few of you have had problems. So – we’ll try and figure this out. My husband and I made these this evening and they are awesome! Thanks for the recipe. They turned out beautifully and are delicious. They were not too challenging to put together either. We topped with some homemade vegan queso. Mine too were sticky after cooking more than double the time. I did find that after they cooled they released from the husk nicely. I froze most of them and now I microwave the frozen tamales and they are delicious. Chuck your instructions didn’t mention whether they need to rest or cool after cooking. Do you unwrap and eat immediately after the 45 minutes in the ipot? A great post indeed. World needs more such delicious vegan and fat-free options. It is funny that most of us think that we cannot make delicious without too much fat based ingredients. Best part is that it is good even for vegans who avoid cow cheese and fat. I made the recipe this weekend and it turned out to be fab. Recipe turned out great after doubling the final steaming time! What a phenomenal idea. Love tamales!!! After the first 45 minutes steaming, the tamales were still mush. Returned them to the Instant Pot to cook for a second time. This time, they firmed up. The only other change I made was — rather than roasting than rehydrating the chilis, I just boiled them directly without roasting. For those who complained of bitterness, that might help. Finally, I made the filling per the recipe, but also made a secondary filling made of soy curls sauteed with onion and garlic then simmered in the chili sauce. So glad to have this tamale option!